This sleek table clock features a brushed and polished brass tone finished metal arch with a glass center panel and a “floating” dial. 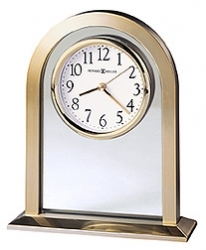 The base is beveled with a polished brass finish and a brushed top surface. The dial is white with black Arabic numerals, and brass hour, minute and second hands. A polished brass tone bezel and glass crystal completes the elegant look. Quartz movement includes the battery.